The ability to experience is, according to my understanding, the most liberating and healing ability we possess. This article explains the concept, both in relation to your inner life, through its use in meditation, and through simple but powerful methods that you can use to remain in tune with the world around you. The ability to experience – to be constantly aware and present – can be learnt and trained. The way to this ability, we find defined, for instance, in the tantric yoga and meditation tradition. The teacher’s foremost task is to awaken the student into being able to experience and to bring him or her out of the judgemental prison, out of all that which the student fears or craves for, and which makes the student forget him/herself and lose the perspective. The first step on the way can occur by learning the meditation Inner Silence (Antar Mauna). When, in the beginning of this meditation, you learn to experience the totality of the sounds around you and when, through the technique, you gain the ability to allow thoughts to flow by, then this acts upon the entire organism, not just upon your mind. The tolerance that arises in relation to your thoughts and feelings, creates an instantaneous harmony and tranquillity and you realize that it is not necessary to identify with all that crops up in the mind. You release deep seated tensions and open up to greater creativity. I know this from my own experience, but, nevertheless, I am amazed by the results my students regularly achieve. I had a young woman on a meditation course in Copenhagen who had suffered from diabetes for some years. During only the second evening of the course, where she learned to relax in relation to her surroundings and thoughts, her insulin production went to work again, by itself. That made me ask, is there really nothing more to it than experiencing thoughts and surroundings for a moment without becoming involved, to make the cause of sickness vanish? Possibly the worst conception one can have about meditation is that it is difficult and that it demands struggle and exertion. As a seeker, one may easily become self-involved. One can get lost in personal dreams, or illusions of exaggerated ideals that one should live up to, or roles to play, or cling to fashionable attitudes and tailor-made explanations of life, to different mythologies – but none of this strengthens the ability to experience, nor does it give a better contact with ones own reality. Through meditation, on the other hand – and also if one wishes to go further with a personal training in a supportive and intense milieu (an ashram), or on a deep going residential course – the teacher can guide the pupil to realise his true identity and essential being. When you know who you are, when you can experience yourself as a spectator in the midst of life, as consciousness, it becomes possible to remain open and let experiences manifest themselves, and thus remain independent of them. During meditation, I let happen what is already happening and experience it without resisting it. I realize that I do not have to use energy to avoid outer or inner disturbances – they transform into experiences that I am done with as they happen. This is not just of benefit to yourself, it also has an impact on your surroundings and raises your tolerance towards others. An international group of scientists, concerning themselves with investigation into consciousness, met in 1980 in the USA at the Human Consciousness Research Conference. Through their research, they were discovering shortcuts to the most effective methods of releasing the mind’s potential. For over ten years, they had studied results from widely disparate forms of therapy, meditation etc., inquiring into how good people were at dealing with daily life and resolving their own problems before and after they had been in contact with one method or another. They unanimously came to this conclusion: Regardless of what you do or study, it is of no benefit if you do not awaken or train your awareness, so that you can be present and experience that which happens here and now – in yourself and in your surroundings. The word awareness is not quite sufficient to describe this state. Consciousness is probably better. For the time being, I prefer to use words such as total-experience or wakefulness. An attunement where everything that occurs in your surroundings has equal significance, regardless of proportion or intensity. You become one with the situation you find yourself in, when you experience it as a totality. You are therefore also aware the moment something makes you forget the wholeness – and yourself. It does not mean, however, to be on guard, or to critically search for special experiences or sensations. Neither do you attempt to set a distance from what is happening by constantly describing or analysing what you experience. When we allow ourselves to experience an existing disharmony – we do not shun it, but remain ourselves in relation to the experience – then, simply by perceiving it, we can incorporate it into the wholeness or liberate ourselves from it. The ability to experience is also trained and used in the special way we meditate upon our own form, the body. This method makes us transcend the body to states closer to our essence. We also deepen our state by awareness of the breath. To experience the body and breath in their entirety – without disturbing the state of the body or process of breathing – releases not just tension, but works also curatively. When you meditate upon the breath, for example, you do not attempt to alter or control it. You just let the body breathe, while you follow the breath and experience it. It is a technique that, in one way or another, is used in all traditions on the Earth where there is mention of meditation. In the same way, you relate to your thoughts – you do not interfere with or attempt to understand the thoughts, you are just aware of them and allow yourself to experience them as objects you can observe. This will make certain thoughts unveil themselves as automatic and recurrent “this is how I am” programmes. When you have become familiar with the meditation, you realize that you are not these thought patterns, and that you can choose to follow them or not. On this foundation, you can make resolutions and carry them through to realisation. Or you can free yourself of that which previously was an unconscious influence. A concealed apprehension, for instance, becomes evident and can be dropped. Medical research that was carried out for six consecutive years during the yearly 3-Month Sadhana Retreat at Haa International Retreat Center in south Sweden, shows clearly that meditation reduces anxiety. But we do not get anywhere if we become frustrated or suppress our thoughts – on the contrary – and if we are given to examining and analysing them and calling them good and bad, then we just cling to them and become self-involved. The open awareness is released by the meditation techniques, the brain is relaxed and remains so during the meditation. When you witness the thoughts and do not identify with them, it makes you able to not block or close up, when expectations, apprehensions or ideas demanding that something in particular should be experienced emerge – and you don’t let yourself get carried away so easily by that which fascinates. The state of meditation will make it possible for you to remain yourself, as the one who experiences. You are present where the thoughts or emotions arise, where consciousness or awakening is needed. goes the old fairy tale. It works almost like a miracle, but to admit and realize the presence of a thought or a state is enough to neutralize it. When, during meditation, we train and develop the ability to remain silent and are content with experiencing the thought, the emotion or the state, then we are freed of its influence. Also in the outer, in your environment, are you present with your consciousness. You can use it either to encounter intense and difficult experiences or in general, to experience the surroundings that you find yourself in right now, as a whole. In that way, you benefit from the experience of meditation and it becomes natural to be more aware in everyday life – this too is an important part of the liberating process of the tantric yoga and meditation tradition. ” When I teach pregnant women, they learn psychic breathing, panting breath and to experience the spontaneous breath. The next time you go into a room full of people – that can be on a bus, at work or at a party, in a supermarket or at a concert – remain standing for a brief moment at the door or in the middle of the room. Stand still and experience the whole situation and your self in the middle of it – the entire room and everybody there. Let your awareness remain open until it perceives everything and, in that wholeness, all the details that may spring forth. Compare this state that you go in to when you do it with the times you are in a similar situation and have just looked down at the floor, or have immediately limited your awareness to one thing or one person. If sometimes, you feel your surroundings as a pressure, or if you feel introverted, imprisoned by thoughts, emotions or states, then this is a startlingly effective method to become free of that pressure again. You will experience a difference so great that you will almost not believe it yourself. Swami Janakananda has been using yoga most of his life. He is the founder of the Scandinavian Yoga and Meditation School. 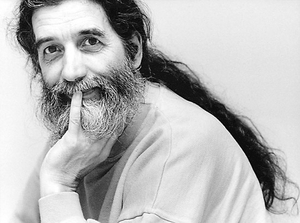 His book Yoga, Tantra and Meditation in Daily Life, now translated into seven languages, has confirmed his international recognition as a consistent and independent exponent of yoga and meditation. Swami Janakananda lives at Håå International Retreat Center, southern Sweden. Håå is a place where people come from around the world, to attend advanced retreats or to live in the ashram – the teaching is mainly in English. Swami Janakananda trains yoga teachers and teaches the great tantric Kriya Yoga.